The holiday season is a time for many things, and one of the most fun things is being able to dress up in your shiniest, best and brightest. But because holiday clothing can be dressy, it can also be tricky to pull off the other 11 months of the year or before the big party. I mean, let’s face it, a sequin skirt is the ultimate statement piece, but how can you pull it off in the daytime without looking like a Moulin Rouge back-up dancer? Actually, it’s not that difficult to take one major piece that is great for an evening party and change a few things to make it wearable for day. I took three holiday staples: the statement cardigan, the little black dress and the sequined skirt and put together three looks that can easily transform from day to night or night to day. (And the most expensive piece is only $89!) After all, who has room in their suitcase for two outfit changes a day. To me, the sequined or jeweled cardi is the 2012 holiday must have because it is easy to slip on over dresses, and it adds a little personality and warmth. It can come across a little mature, though, so be sure to balance the look with trendier pieces so as not to look like you’re going to an ugly sweater party. 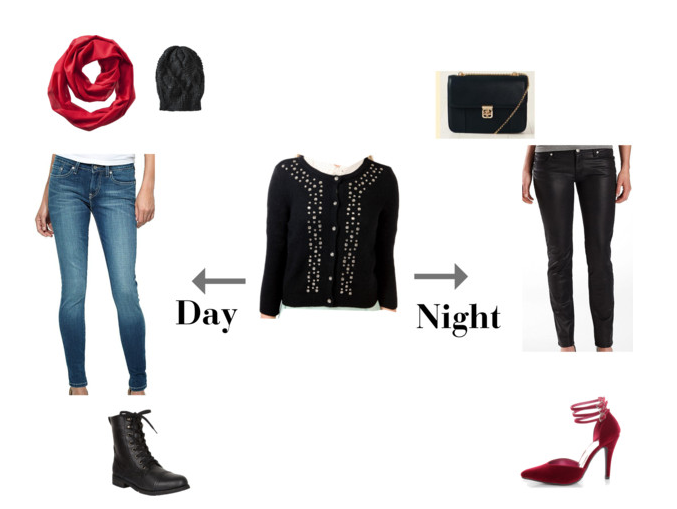 For daytime, I paired the look with skinny jeans and added combat boots to toughen the sweetness of the sweater. Add a beanie and a red infinity scarf, and you are ready for a family outing or a trip to the mall with the girls for after-season sales. To transition the look to nighttime, grab coated skinny jeans and burgundy heels (burgundy is the color of this season). 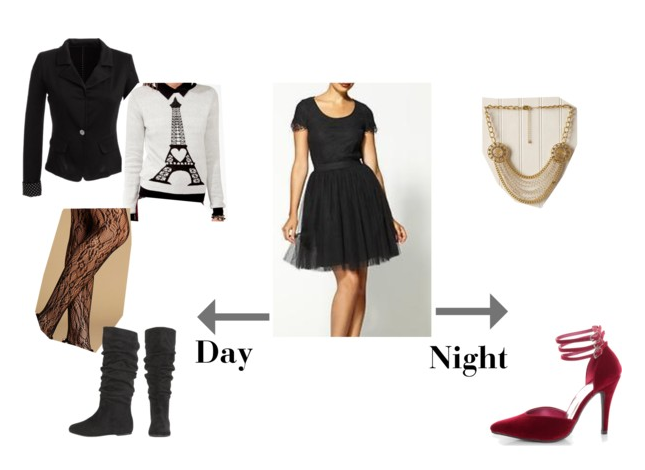 The velvet on the heels add an interesting spin to the outfit and help dress up an otherwise “blah” black ensemble. It’s classic, it’s chic, and it’s certainly timeless. There isn’t a season or time period I can think of that doesn’t have the LBD in it. That said, if you are ever in doubt about what to wear to nearly any occasion, it is always a good answer. This tulle and lace LBD is sure to turn heads at any holiday party or formal event. Since the tulle does make it ultra dressy, I would balance it with a printed sweater layered over the dress and add a black blazer for daytime. Keep the rest simple with black boots and tights. For evening, let the dress do the talking by keeping your accessories down to a simple necklace. I love these burgundy heels with this outfit, too, and I think they would keep the look classic but interesting. This piece is the showiest and most luxurious of the three, and it can be the trickiest to style. But it is the ultimate holiday party piece, and the risk is worth the effort. For day, make sure that you keep the rest of your items as simple as possible because the skirt is your statement accessory, and it needs no competition. I chose a classic white oxford, and I would wear a denim shirt as a jacket over it. The juxtaposition of the business-like top with the party-like bottom makes a cool statement that is sure to make you the most creatively dressed in the room. To make the look even more unique, I added brown combat boots. For evening, I chose a classic cable sweater in a bright fuchsia color to pop against the gold. Since these two pieces are very loud, I chose basic black tights and flats to complete the outfit. As the year’s end approaches, be sure to celebrate in style, both day and night. Holiday style is all about making a statement, so let your creativity flow freely. After all, it is the most wonderful time of the year!